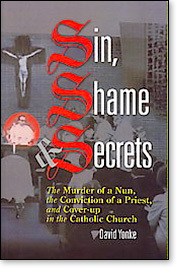 As some in the secular media continue their attempt to take down Pope Benedict (Phil Lawler has a good commentary on these developments here, by the way), I'd like to revisit two unresolved scandals, both of which involve assertions made by authors. 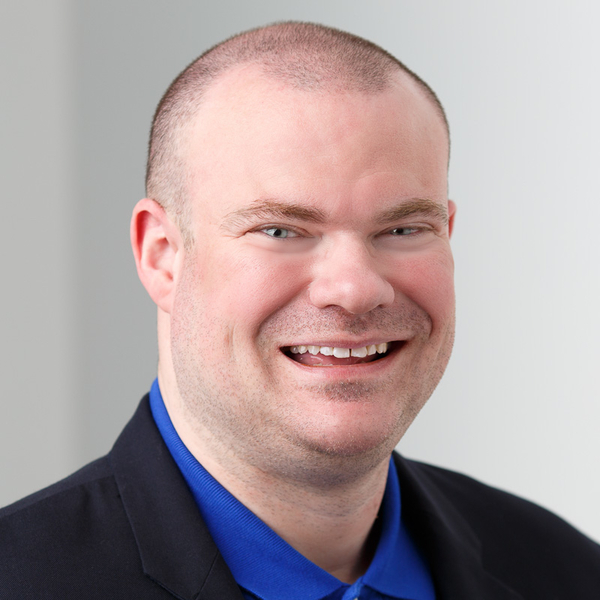 The first: David Yonke, religion editor of the Toledo Blade, who wrote in his book Sin, Shame, and Secrets (on page 176) that the Diocese of Toledo has a "privileged" file containing information about abortions paid for by the diocese. Yes, abortions paid for by the diocese! I've written about this scandalous revelation before, on more than one occasion. The reaction from Church officials? The reaction David Yonke — a reputable journalist/author — received? 'Matt C. Abbott, a Catholic columnist from Chicago who writes for www.renewamerica.us, contacted me this week about a segment of my book that reports on the Lucas County investigators' search of the Toledo Catholic Diocese's headquarters. 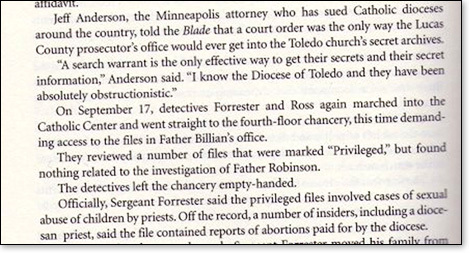 The investigators had felt the diocese was withholding information relevant to their case against Robinson and entered the HQ armed with a search warrant — two times — to search diocesan files. The second time, investigators found a file marked 'privileged' that contained documents about abortions for which the diocese had paid. I know this section was a ticking time bomb and is in its own right — apart from the murder, the satanic abuse, and all the other horrors reported in Sin, Shame & Secrets — a terribly disturbing revelation for a church that is vehemently pro-life. The second: Father Andrew Greeley, is his 1999 non-fiction book Furthermore! Memories of a Parish Priest, wrote about a yet-to-be-exposed "ring of predators." I've written about this matter on several occasions, including here, here and here. 'Too many people co-opt the treatment of clergy crimes for an agenda, either conservative or liberal: it's the celibate clergy; it's the evil heretics; it's the male-dominated priesthood; it's the patriarchy; it's the bad liturgy and bad seminaries; it's the psychologists. 'It is [actually] evil choices made by men who choose to serve the evil one directly or indirectly (seeking wealth and power), who turn what is in their purview to that service, and who choose not to do justice for the victim and justice to the malefactors. "Criticism of Catholic Church is unfair"
"A Response to the New York Times"
"Keeping the record straight on Benedict and the crisis"